This awkward weather time where it’s not quite warm enough to wear short sleeves, but you’re so sick of sweaters has made me realize just how much I love oxfords. They will always be my go to shirt. They look great with a skirt, shorts, jeans, khakis, or even leggings. They can be dressed up with jewelry or dressed down with layering. Truly the most versatile shirt ever invented. My collection keeps growing, and I’m completely okay with that. I may or may not be writing this post while sitting in a plaid oxford. So while oxford shirts seem to be the staple for every girls wardrobe today, they actually have been around a lot longer than you would have thought. 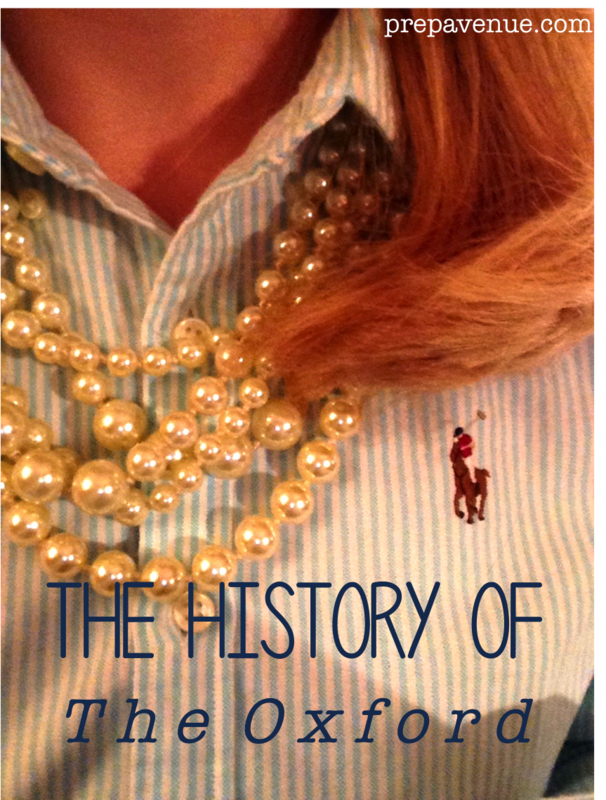 Considering I wear one almost every day I thought I would dig up a little history about the classic oxford button down. The oxford shirt has long been an essential part of the Ralph Lauren man’s wardrobe. Originally made in the 19th century by Scottish fabric mills, the oxford shirt is one of four shirt fabrics named after universities. The others —Yale, Cambridge and Harvard—have long since ceased to be produced. Defined strictly by the oxford weave, a basket-weave pattern that combines two yarns woven lengthwise against a heavier yarn crosswise (oftentimes in a different color to give it a distinctive pattern), or vice-versa, the oxford shirt is easily recognizable. Although some of these shirts are now made with other synthetic fabrics, the look and essence of the original oxford is still present. Oxford shirts frequently, but not always, have button-down collars. Now associated with the preppy Ivy League style, the oxford shirt was formerly a sport shirt for polo players in England. Polo players would wear long-sleeved oxford shirts for their matches, as the fabric was comfortable and breathable. The oxford shirt has evolved into an important staple piece in the Ralph Lauren world and is available every season in an array of colors. Incredibly versatile, it is appropriate in many settings. The oxford shirt is the perfect laid-back piece that conveys a sense of ease and comfort while creating a sleek, clean look. It can also be dressed up with a repp tie and a navy blazer for the ultimate in preppy attire, a true nod to the essence of the Ralph Lauren lifestyle. After reading that I’m not quire sure who’s more obsessed with oxfords, you or me? These are my three favorite colors Ralph Lauren makes. They are perfect in the winter under the sweater and great in the summer with a pair of chinos. I've come to the conclusion you can never go wrong adding another oxford to your wardrobe. Thanks for the history! It's nice to learn little bits here and there about things in our everyday lives.